Jammy eggs are my new jam! Ha! 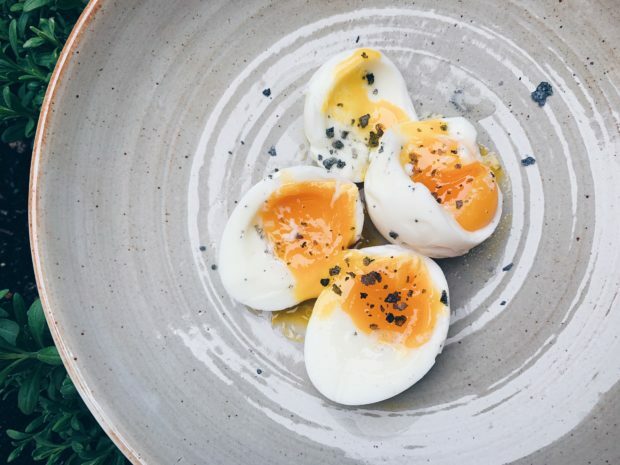 Even though they need more supervision than hard-boiled eggs, they’re easier to make than poached eggs. They’re perfect to top your sourdough-avocado toast with or to jazz up your instant ramen. A spider skimmer is useful here; in fact, it’s one of my most used kitchen tools. If you don’t have one, you really should buy one. 1. Boil enough water in a small saucepot on high heat to make sure your eggs will be submerged. 2. When water is boiling, adjust the heat to low and gently add the eggs using a spider skimmer. 3. Re-adjust the heat back to high and cook for 6 minutes. No more; no less. 4. Turn off the heat after 6 minutes and scoop the eggs out using the spider skimmer and run them under cold water in the sink until they’re cool enough to handle and peel. Slice in half and serve with your favorite accoutrements.